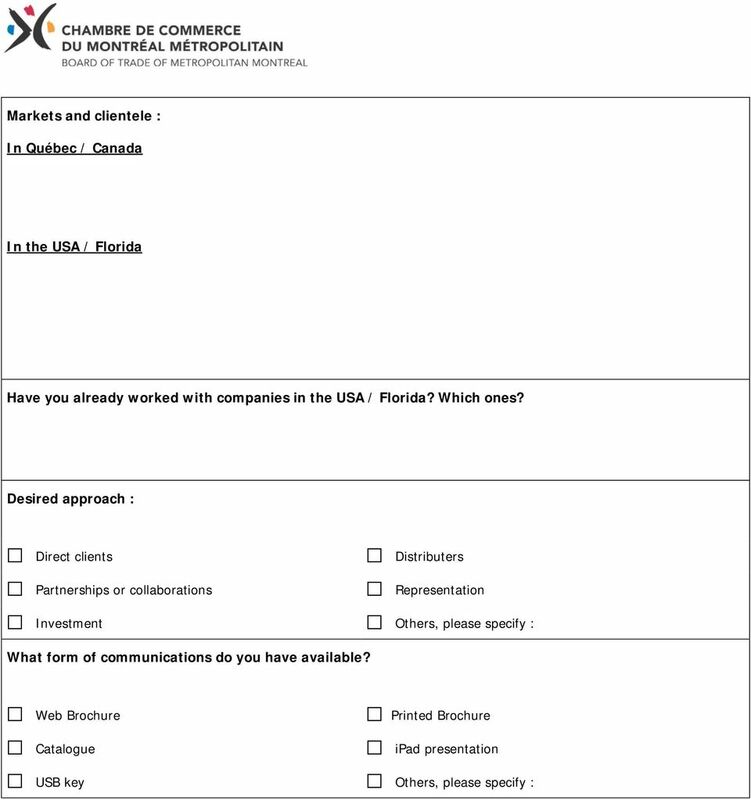 1 Registration form (formulaire aussi disponible en français) TRADE MISSION TO FLORIDA September 29 to October 2, 2015 One form per participant please Contact Information TRADE MISSIONS Membership number* Non-member * Your membership number is necessary in order to benefit from the member rate Mr. Ms. First name Last name Title Address City Postal code Company Web site Province Telephone Fax Cellular during the trade mission Allergies Contact person in case of emergency Mr. Ms. First name Last name Telephone 1 ( ) Telephone 2 ( ) Your Quebec enterprise number (NEQ ) If you don t know it, please visit the enterprise register: Registration Fees Member Board of Trade of Metropolitan Montreal $ $ Non-member Board of Trade of Metropolitan Montreal American Express MasterCard Visa Check* Payment Card number Expiry date (mm/yy) Card Security Code (CSC or CVV) A group of 3 digits located on the back of your card, to the right of the signature strip. On American Express cards, a group of 4 digits on the front towards the right. Cardholder s name Signature * Purchases of $500 or less require payment by credit card. For purchases of $500 or more, credit card accepted or check payable to: World Trade Centre Montréal, 380 St-Antoine St. West, Suite 6000, Montréal, Quebec H2Y 3X7 Return by to: For more information: , ext Quebec participants: The costs of the trade mission are eligible as an expense under Bill 90 promoting corporate manpower training. Cancellation policy: An administration fee of ten percent (10%) plus taxes, based upon registration fees, will apply to cancellations received before August 17, 2015 Cancellations received after this date will not be reimbursed. Payment policy: The final payment must be received before August 17, 2015 Limits of liability: The participant and the organization whom the participant represents hereby release the World Trade Centre Montréal and the Board of Trade of Metropolitan Montreal from any liability whatsoever, and they hereby waive any recourse, claim or legal action of any kind whatsoever, including, without limiting the generality of the foregoing, any recourse, claim or legal action relating to bodily injuries, material losses, illness, accident, hospitalisation, repatriation, problems with police or legal authorities, or legal actions, whether same result from a statement, act or behaviour of any kind whatsoever made or carried out by the participant before, during or after the trade mission. The World Trade Centre Montréal and the Board of Trade of Metropolitan Montreal cannot be considered to have defaulted in the execution of their obligations should such execution be delayed, held back or prevented by force majeure. Force majeure includes all causes that are out of the parties control, that the parties could not reasonably have foreseen and against which they could not protect themselves, including but not limited to cases of accident, strike, partial or full work stoppage, lock-out, fire, natural disaster, riot, intervention by civil or military authorities, cooperation with any governmental authorities rules or instructions, and acts of war (declared or not). 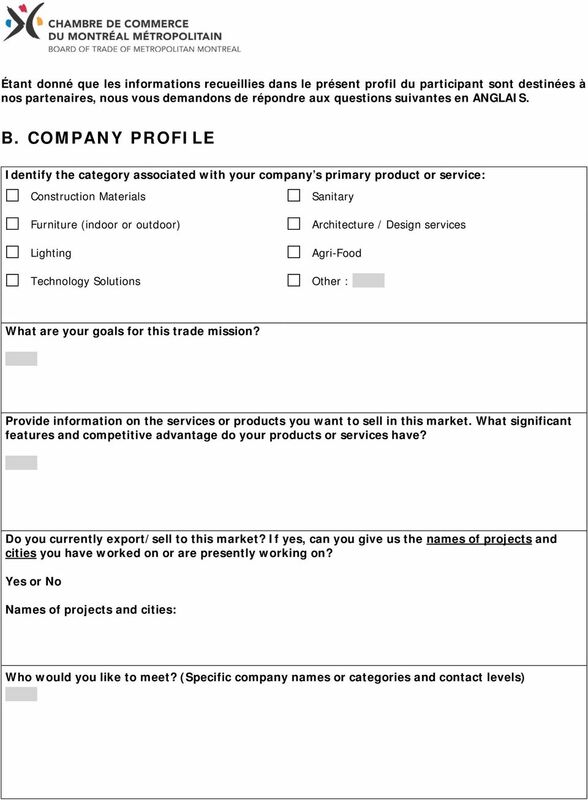 4 Are there companies or categories of companies that you would not like to meet? Will you organize other meetings on your own? If yes, which companies will you meet? Is your company established in this market? If yes, could you provide the location of your branch (es)? In terms of number of employees, how large is your organization? In terms of annual revenue, how large is your organization? Less than $500,000 $25 million to $50 million $500,000 to $5 million Over $50 million $5 million to $25 million Not applicable What percentage of your organization s activities is related to exporting? % Are your products or services subject to international standards and/or regulations? Yes or No Which ones? 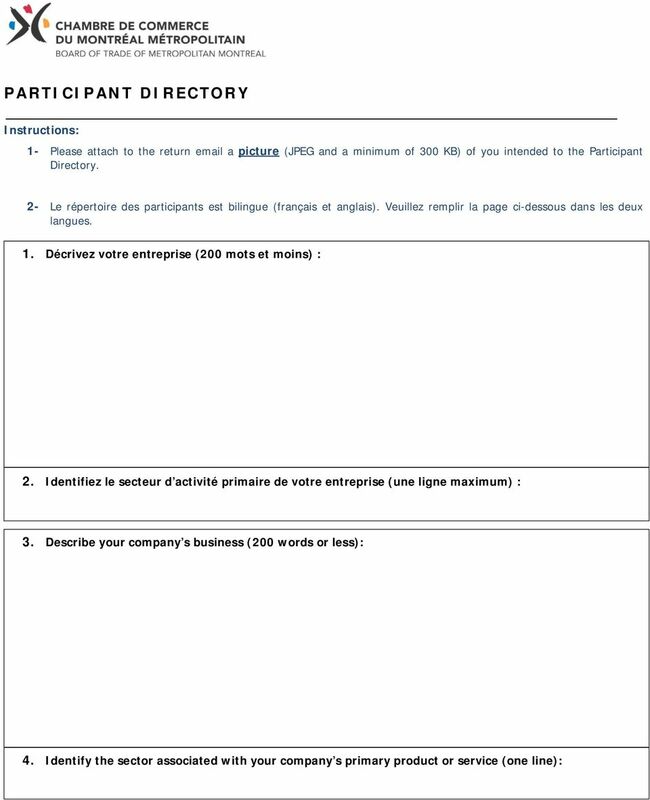 To help you fill out this form, a Companion Guide is available on the AMF website, at www.lautorite.qc.ca, in the Public Contracts section. PLEASE COMPLETE THIS APPLICATION IN FULL. THIS FORM IS THE BASIS UPON WHICH INSURANCE IS PROVIDED. IN THE EVENT OF A NON-DISCLOSURE OR MISREPRESENTATION, THE POLICY MAY BE VOIDED AT THE OPTION OF THE INSURER. Once we have received all the above required documents, we will process your claim and inform you of the outcome as soon as possible. ACCIDENT CLAIM FORM Dear Claimant, We are sorry to learn of your accident. In order for us to process your claim, we require the following: 1) Claimant s Statement. 2) 1 Clinical Abstract Application Form. Why do you need Visiting New Zealand insurance? STUDENT APPLICATION FORM International Mines Albi Graduate school of Engineering ECOLE NATIONALE SUPERIEURE DES MINES D ALBI-CARMAUX. 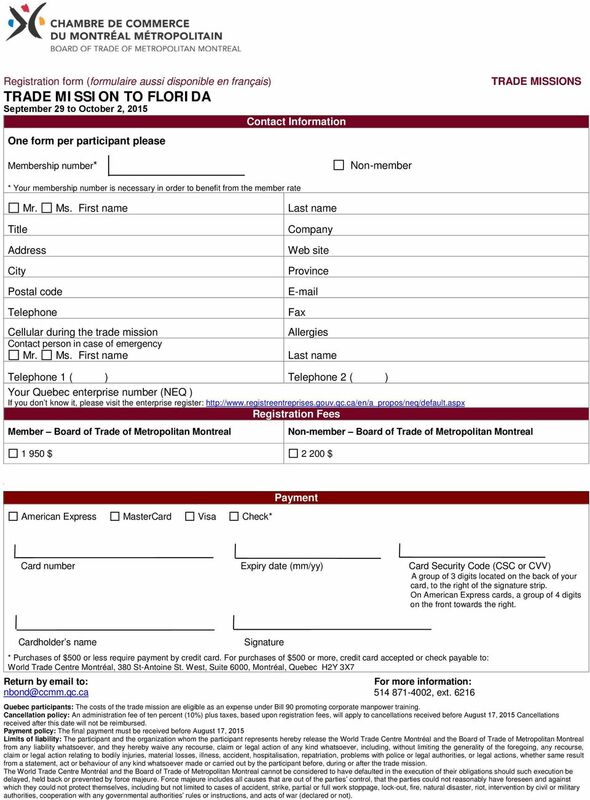 Checklist Signed copy of this checklist Application form Sworn Statutory Declaration (page 3 of the application form) This document must be sworn with a commissioner for oaths, notary public or lawyer. For verification, please attach a blank cheque marked VOID to this completed Authorization. GENERAL TERMS AND CONDITIONS OF MERCK CANADA INC.
LETTER OF TRANSMITTAL YANGAROO INC.